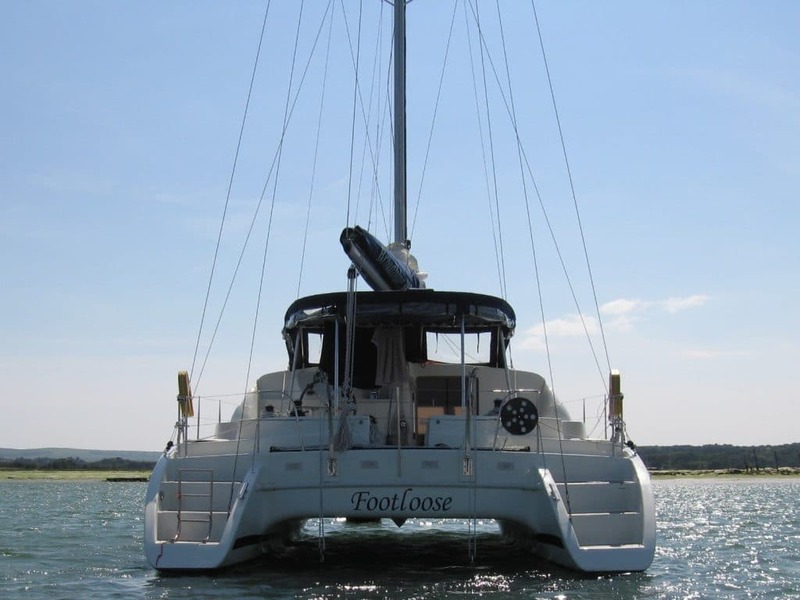 Footloose has been maintained consistently from new by the vendors, to provide safe, comfortable and convenient cruising, being equipped to journey into any waters. She is fitted out to be completely independent at sea, subject to the purchase of provisions and fuel, thus avoiding the need for frequent calls into port. 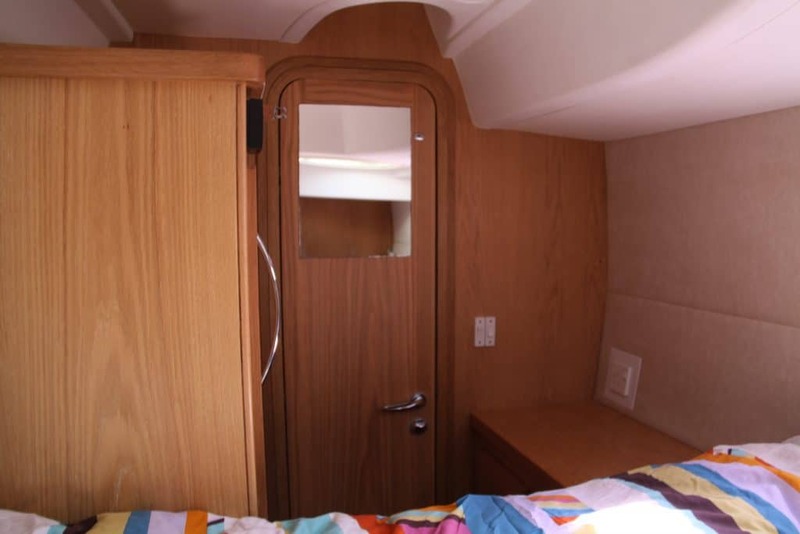 Length: 11.78 M / 38.65 Ft.
Beam: 5.98 M / 19.68 Ft. 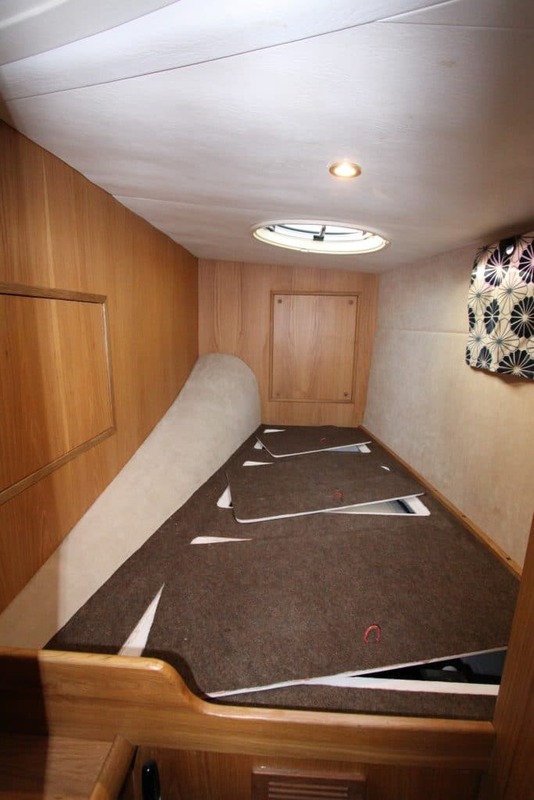 Draft: 1.12 M / 3.68 Ft.
Headroom: Hulls: 2.00 M / 6.57 Ft.
Saloon: 2.00 M / 6.57 Ft. Keels: Fixed, low aspect ratio fin keels. Structure: GRP with additional epoxy coating and CuProtect antifouling below waterline. 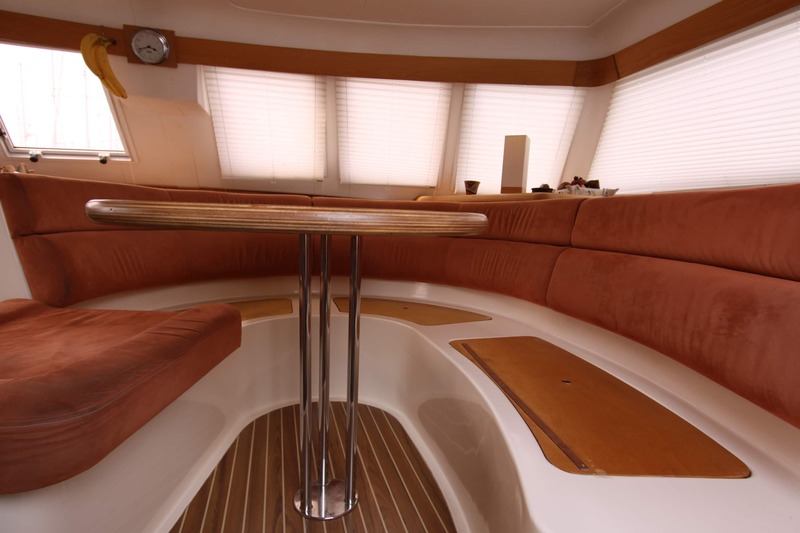 Designer: Robert Underwood, David Feltham & Stuart Davidsen for Broadblue Catamarans. RIG: Sloop. Easily handled with all lines leading to cockpit. 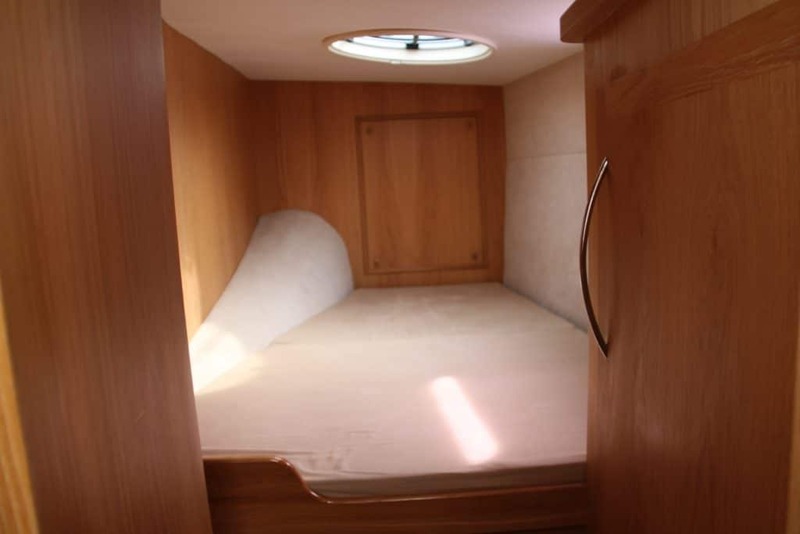 SAILS: Fully battened Mainsail, loose footed with “Cunningham” adjustment and slab reefing. Lazyjack system and stack pack. Head pull-down line. 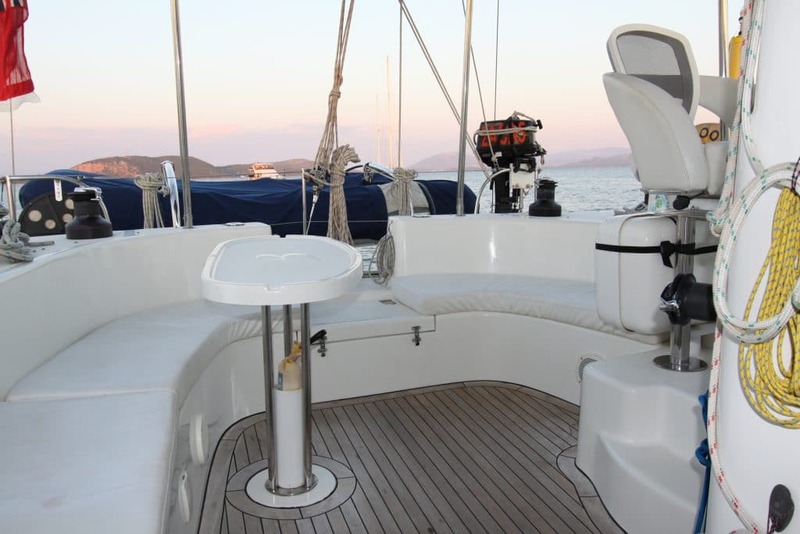 Genoa with Hood roller furling gear. Gennaker on prodder, with Hood roller furling gear. 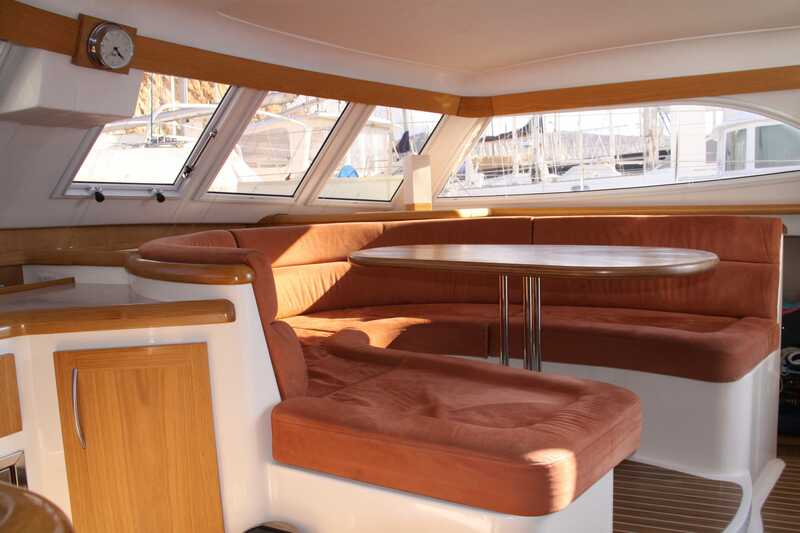 Bridgedeck: Saloon area with contoured soft furnished seating in Alcantara fabric around fixed dining table. 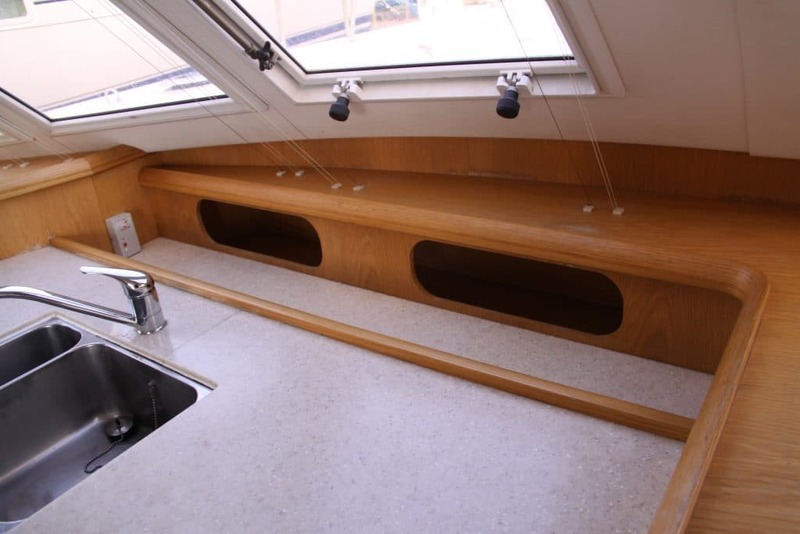 Galley with double s/s sink and mixer faucet. mounted in Corian worktop with inset storage bin. Gas hob with three burners. Oven/grill under. 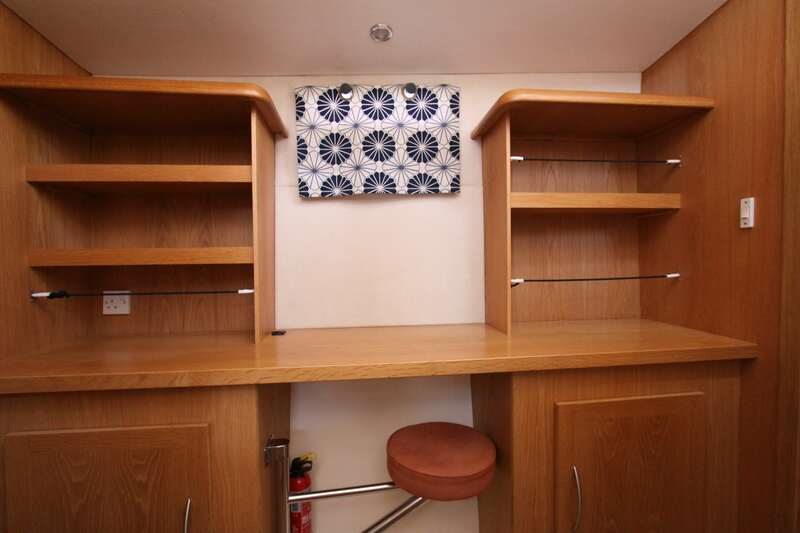 Utensils drawer, pan cupboard and larder cupboards. 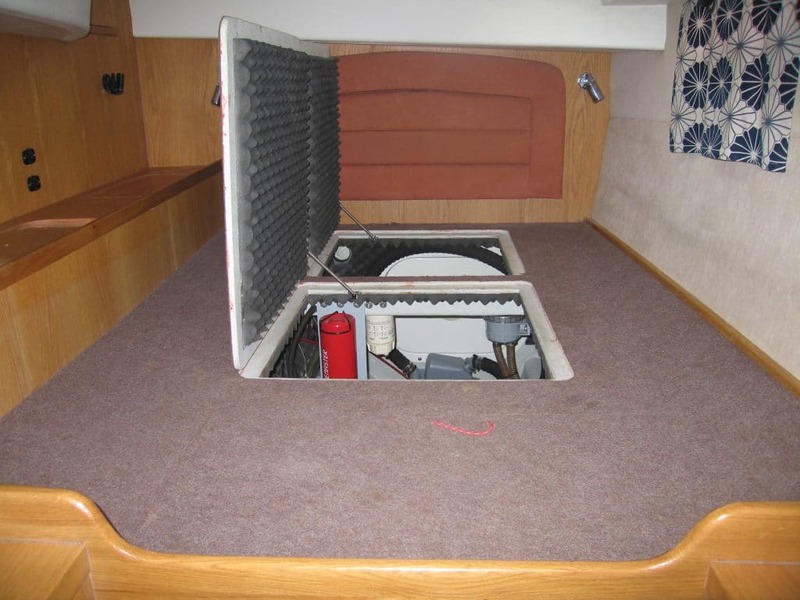 Under-seat icebox (could be upgraded to freezer). Chart table with drawer and swing-out seat under. Fixed fwd windows to saloon x 4. Opening fwd windows to saloon x 2. Large side windows x 2. 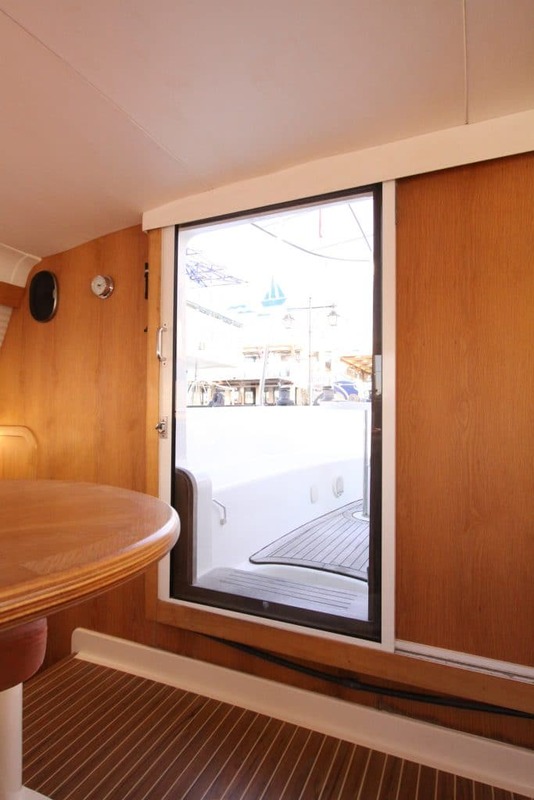 Oceanair pleated blinds to all saloon windows. 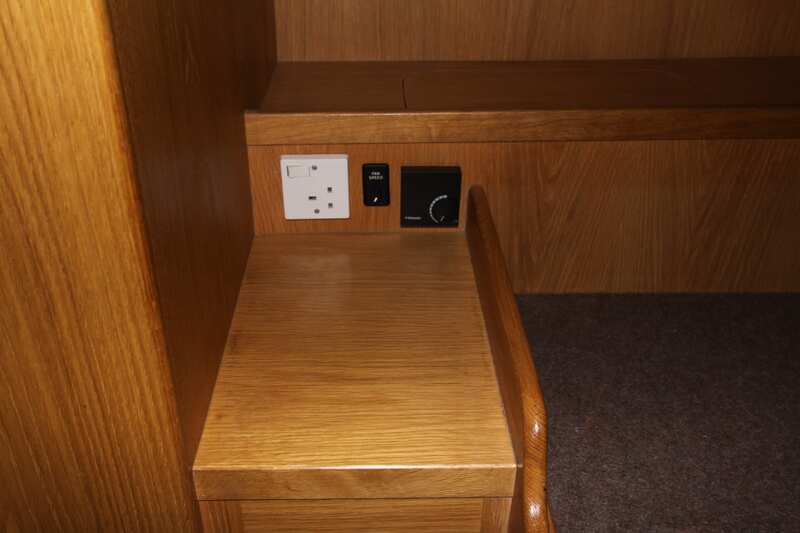 All joinery in light oak. Stereo radio/CD player with Ipod connection. Stereo speakers to saloon x 2 and cockpit x 2. Aft main cabin with double berth (King size), wardrobe and cupboards. Amidships office area with cupboards below and shelves above desk. Swing out seat under. Equipment storage and cutlery drawer. 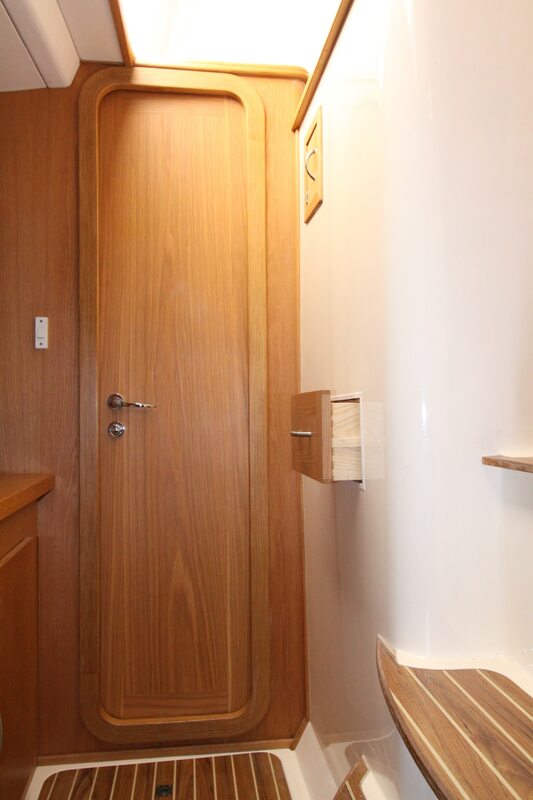 Heads fwd with wash basin, cupboard, mirror and heated towel rail. Separate shower in peak with s/s rail for wet-gear. 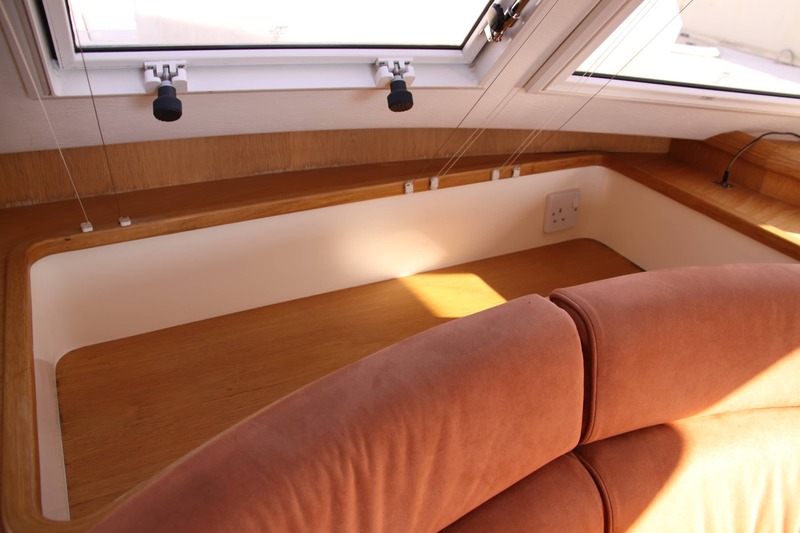 Privacy blinds to hull windows. 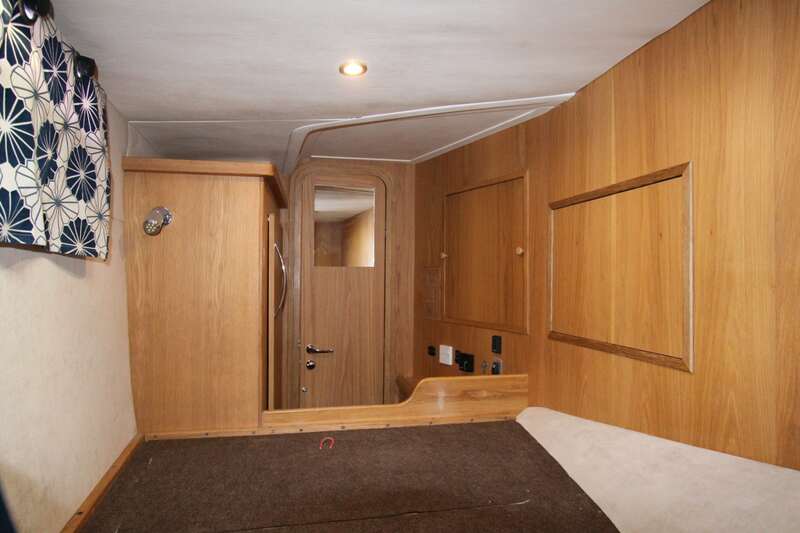 Aft guest cabin with double berth (Queen size), wardrobe and cupboards. 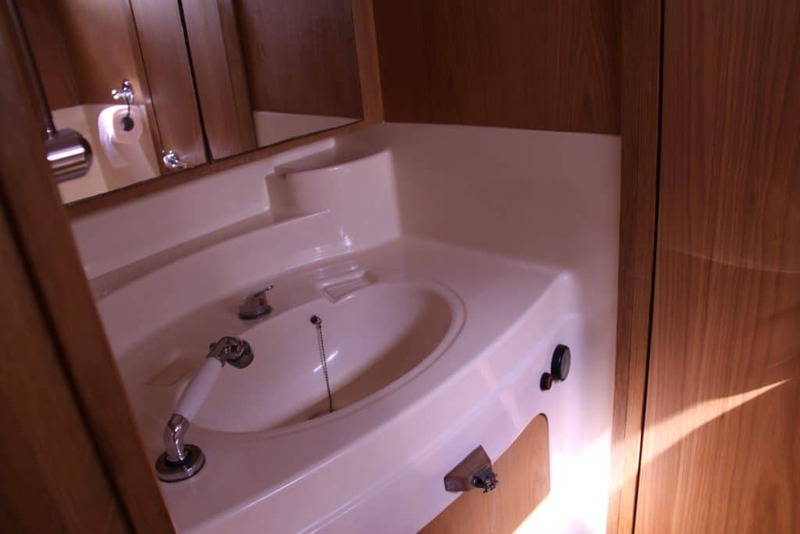 En suite heads and shower combined with wash basin, cupboard and mirror. 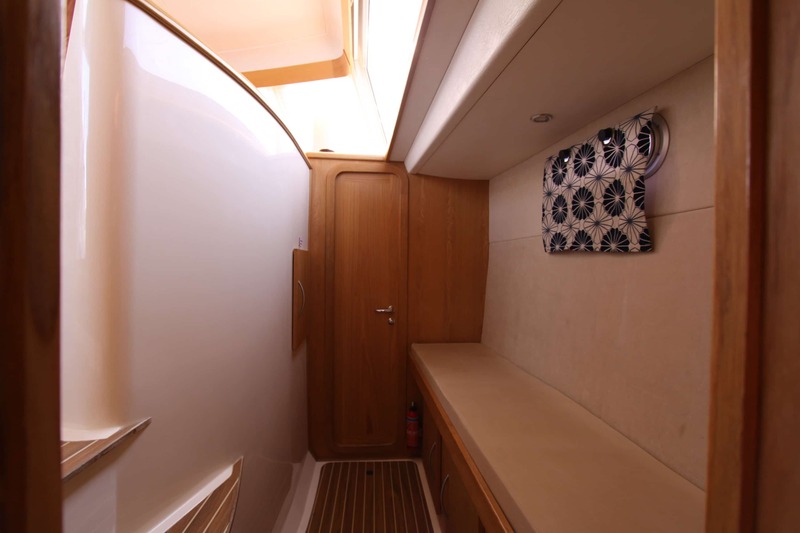 Amidships pilot berth with cupboards under. 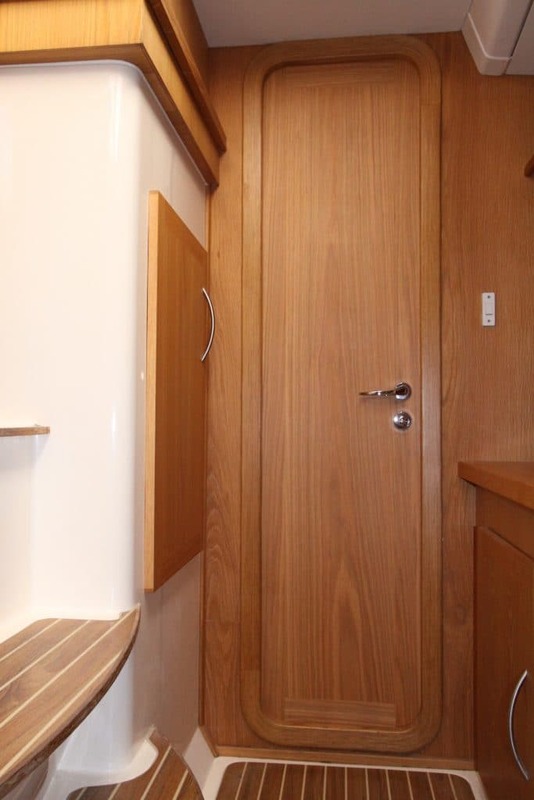 Fwd cabin with double berth (Standard Size) and full height wardrobe. 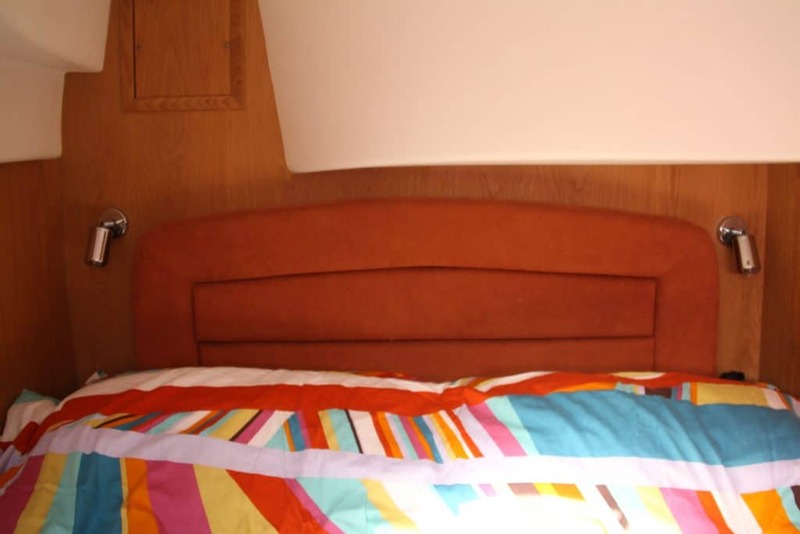 Under-bunk storage compartments x 2. Cockpit: “Attwood Armchair” helm seat. 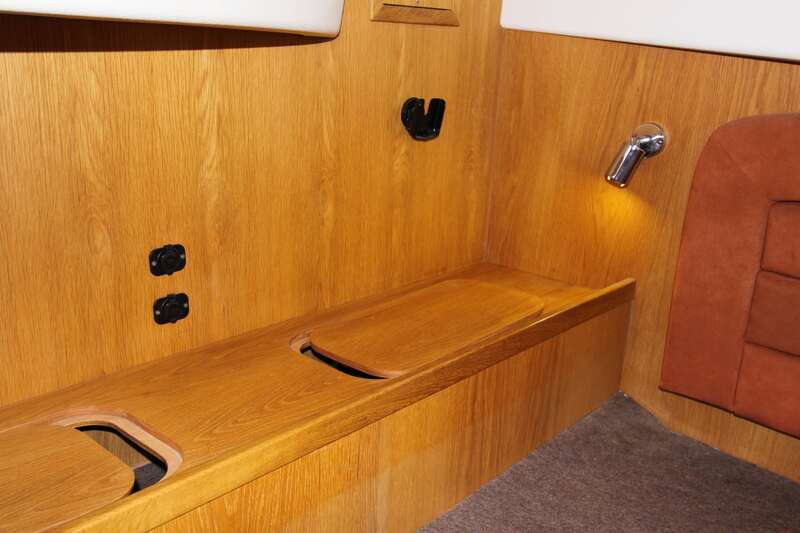 Full length cockpit seat cushions (white) and fixed grp table. Teak decking to cockpit floor and sugar scoops. 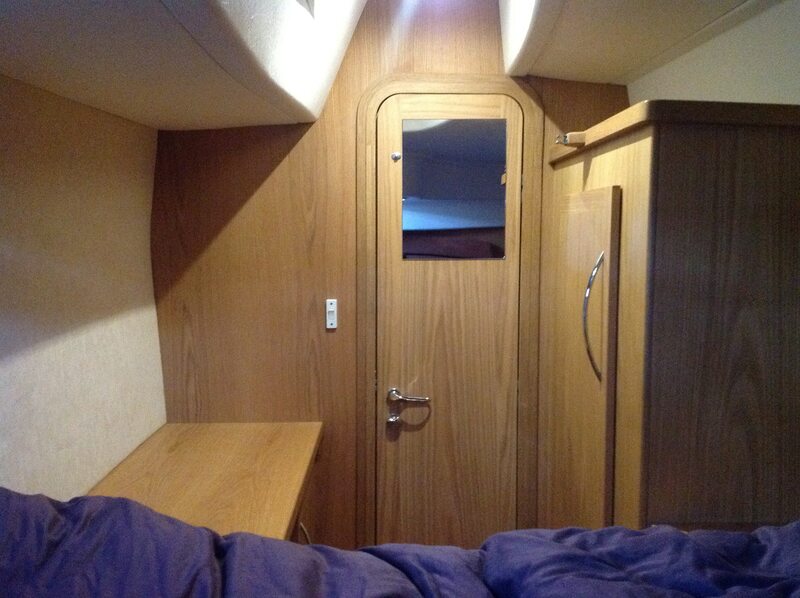 Bimini frame (Broadblue fitted) with canvas top, front, back and side panels. 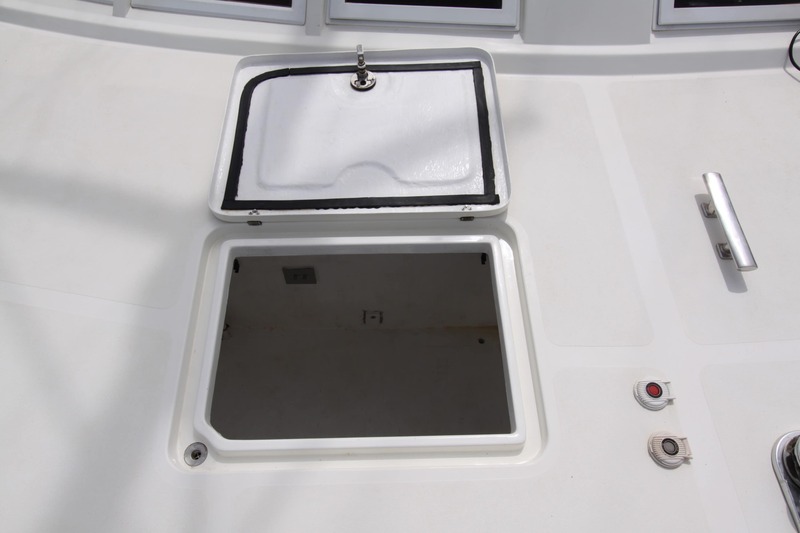 Large self draining storage lockers x 2 in foredeck with ample stowage for three gas bottles, ground tackle, fender and warp stowage and outboard fuel. 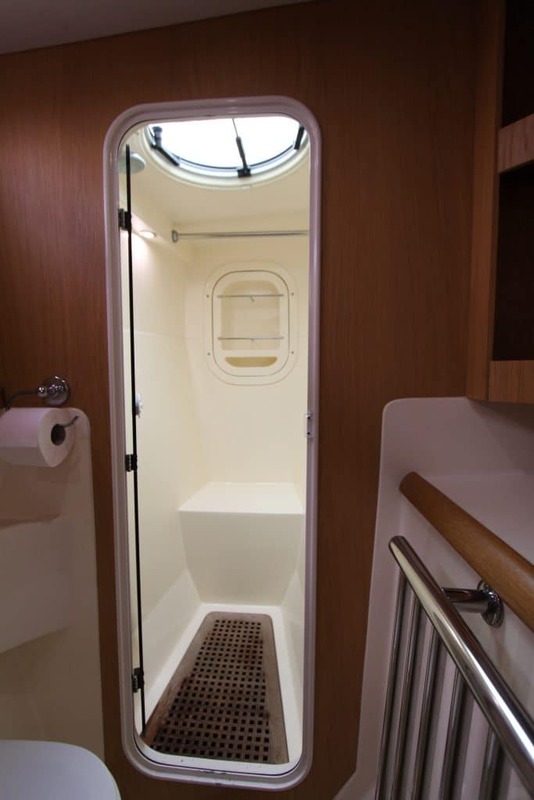 and space for general stowage. Volvo Penta D1-20 engines fitted to Volvo S130 Saildrive units x 2. Flow alarms fitted to raw water systems. 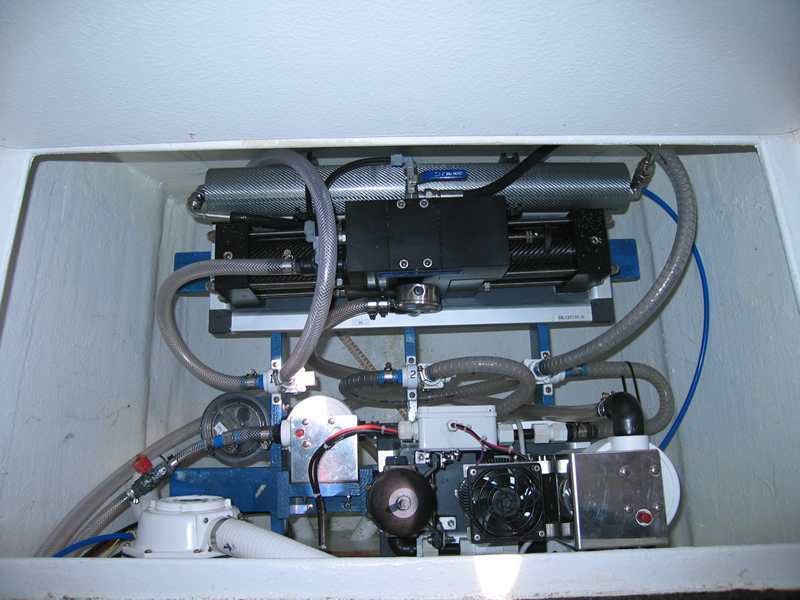 tanks, each of 230 ltr, supply engines via combined filter and water separators. 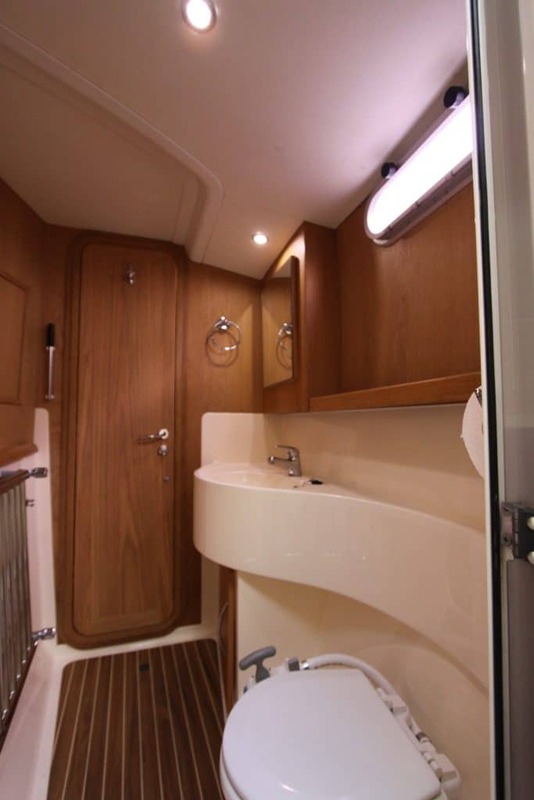 Pressurised hot and cold water to galley, wash basins and showers, supplied from 215 lt x 2, thick walled high grade linear polythene water tanks with electrical contents gauge indicators in fwd stb cabin and on main switchboard. Hot water is supplied from dual coil calorifier (25 litres). Heated by either 230V immersion heater, port engine cooling water or Webasto water heater. 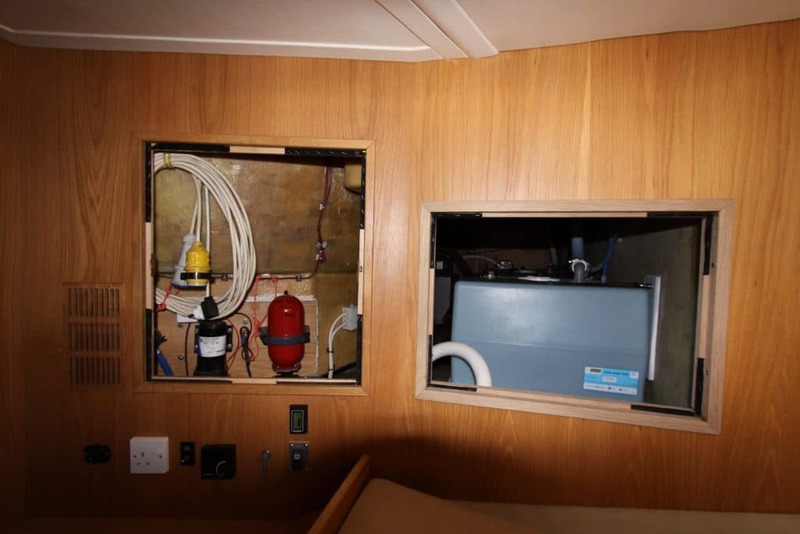 A Schenker 30 water maker, fully overhauled and modified to latest standard in January 2016, is installed in under-berth locker in stb fwd cabin. 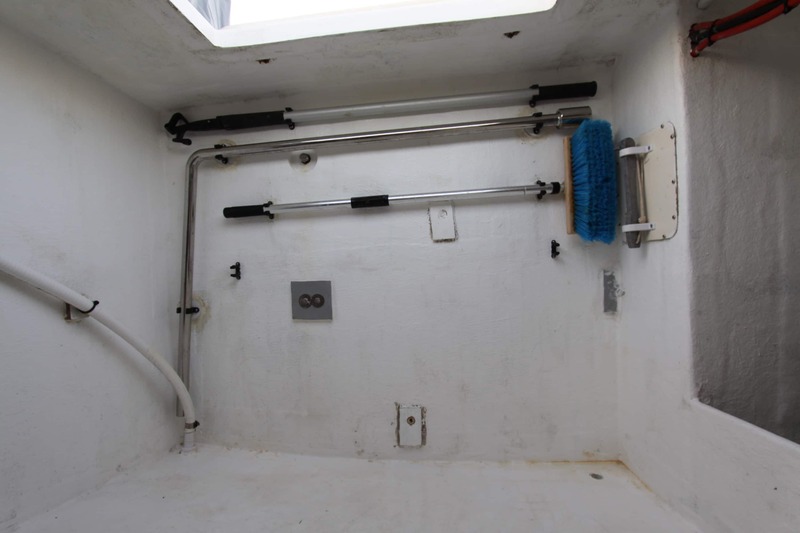 Its potable water outlet is selectable to faucet in cockpit or freshwater tanks. 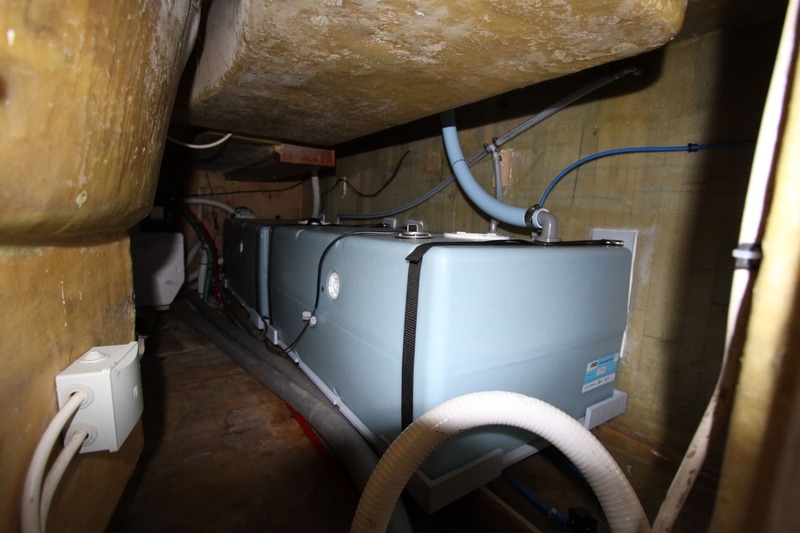 Holding tanks (61 litres) x 2. One in each keel with option of manual pump-out to sea or deck suction points x 2. Electrical contents gauge in each heads. 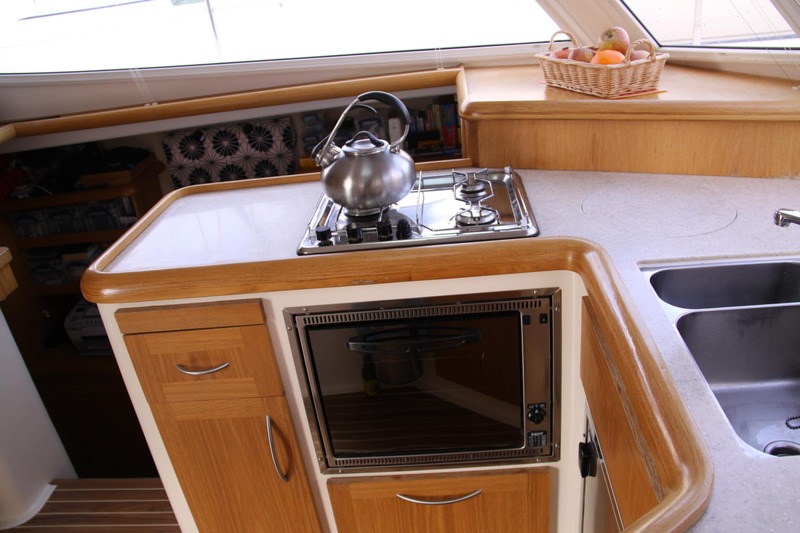 A butane gas supply is fed to cooker hob and oven with an isolating valve adjacent to galley station. 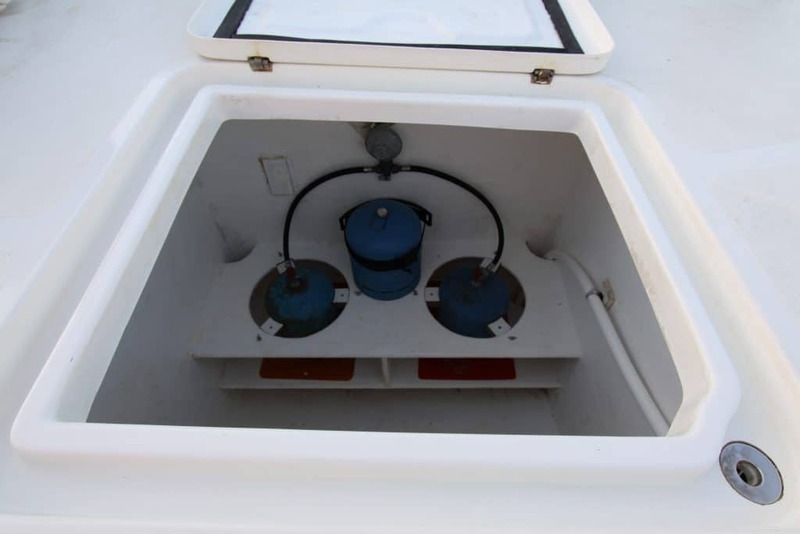 Gas bottles are stowed in port fwd deck locker which drains directly to vessel exterior. There is stowage for three gas bottles, of which two can be connected to system, ready for use, via a selector valve/regulator. Designed primarily for Calor Gas (4.5kg) bottles, Camping Gaz (2.72kg) bottles can also be accommodated by using fitted adapters. 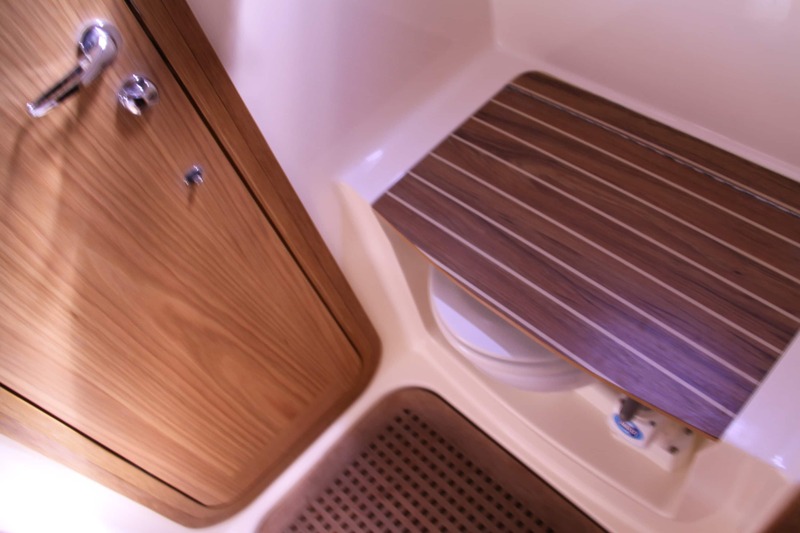 Webasto diesel fuelled heater, provides closed circuit of hot water to blown air heating matrix in cabins and saloon, to heated towel rail in port heads and calorifier (when space heating is not required system can be switched to provide heating only to calorifier and towel rail). Shore power socket on port sugar scoop. 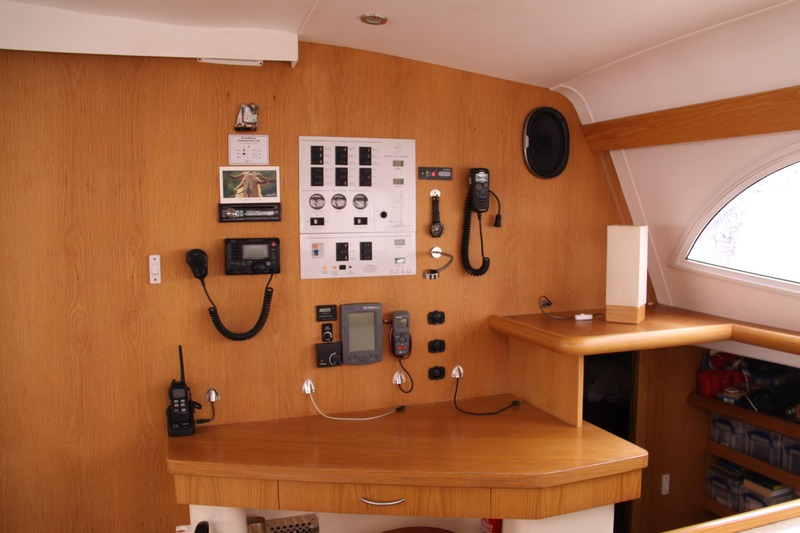 AC and DC display and distribution panels over chart desk. Xantrex 30 Amp battery charger, with control panel over chart desk. 230V single socket outlets (UK style), in cabins, galley and office. 300W inverter with twin socket outlet. 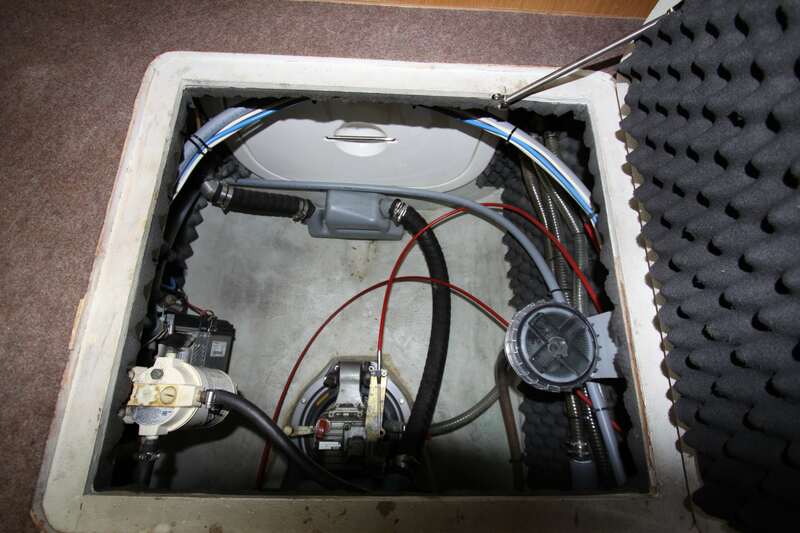 Can also be directed to the 230V ring main sockets. 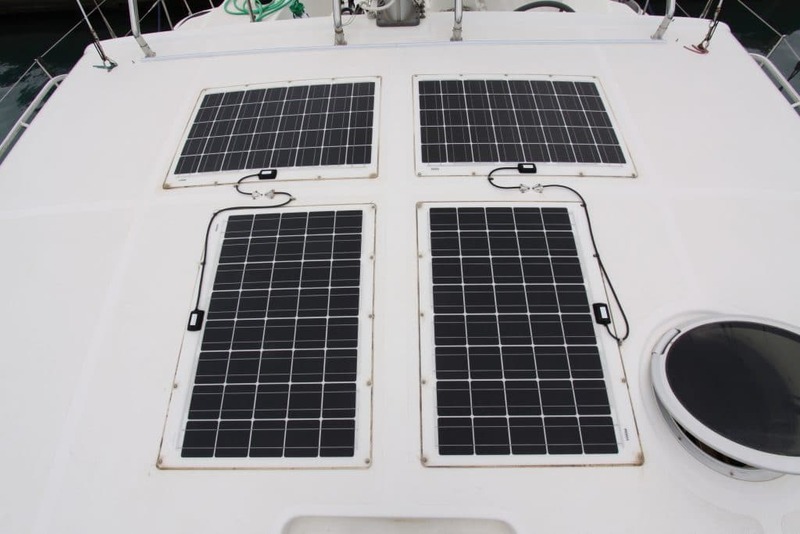 Sunware solar panels (70W x 4) mounted on coach roof, charging service batteries via solar regulator. Saloon x 1 plus twin USB. 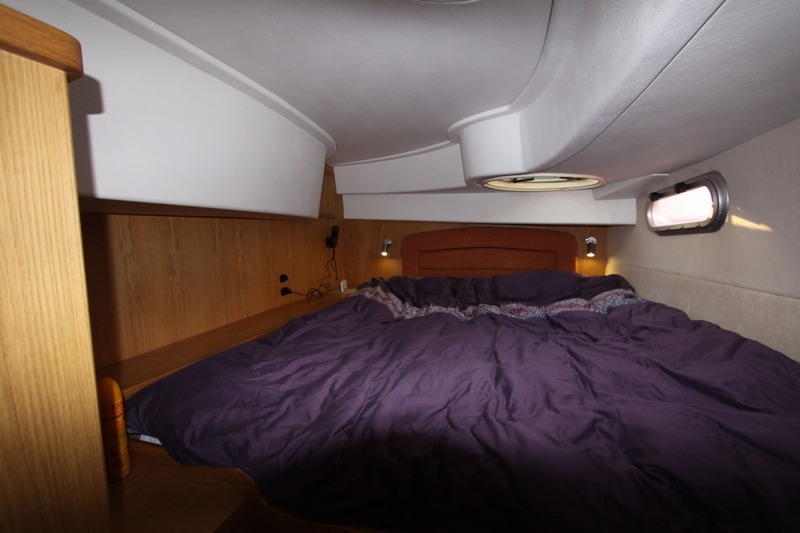 Port stern cabin x 2. 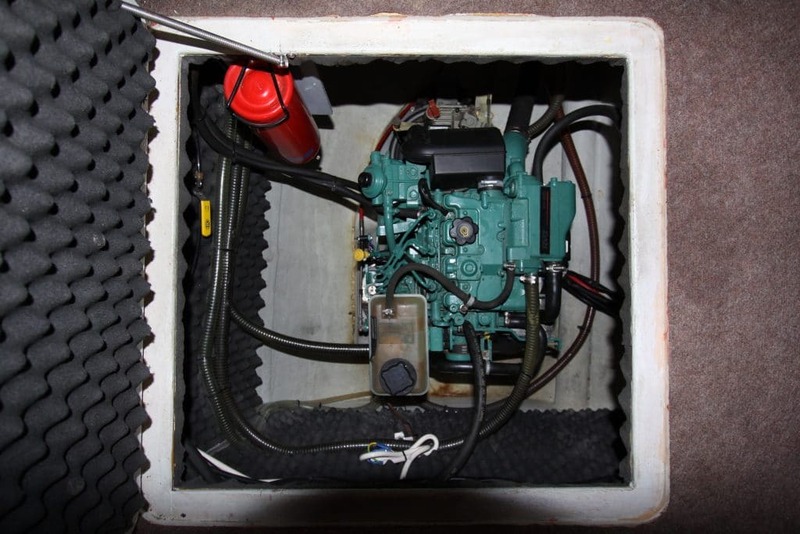 Port engine – 94 Amp/h Rolls AGM maintained via dedicated 12V/12V charger from service battery. 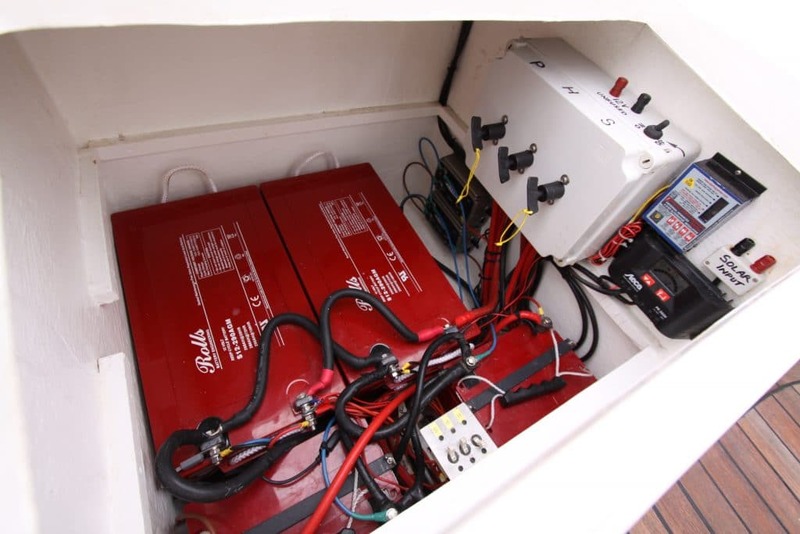 dedicated 12V/12V charger from service battery. Rocna 25kg anchor (primary) with 70m x 8mm chain plus 15m warp. 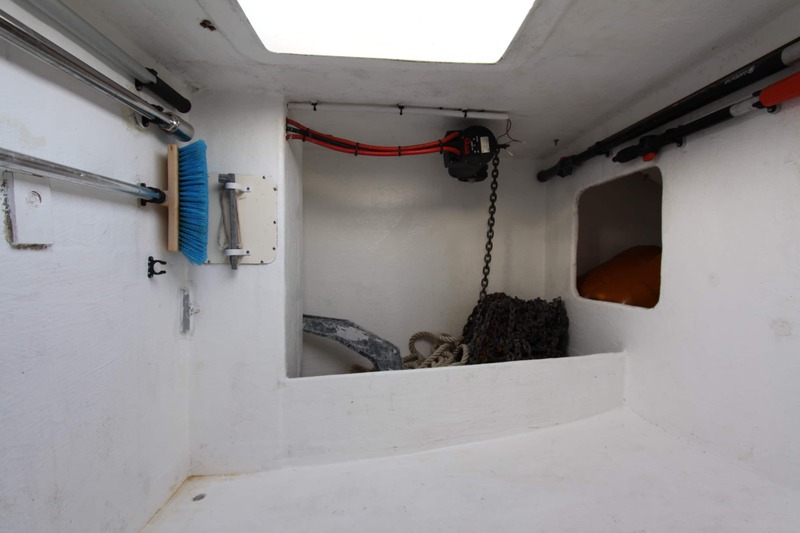 Fortress FX23 anchor (kedge) with 5m x 8mm chain plus 50m tape (Ankarolina, pushpit mounted). Bow bridle for anchor chain. 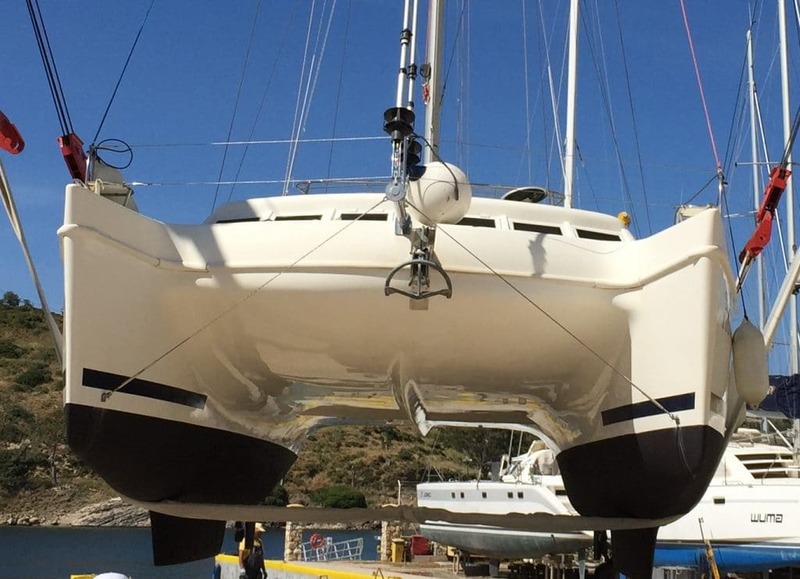 Adequate mooring warps with 4 x reinforcing chains and shackles. Galvanised steel anti surge springs x 4. Large spherical fender x 1. 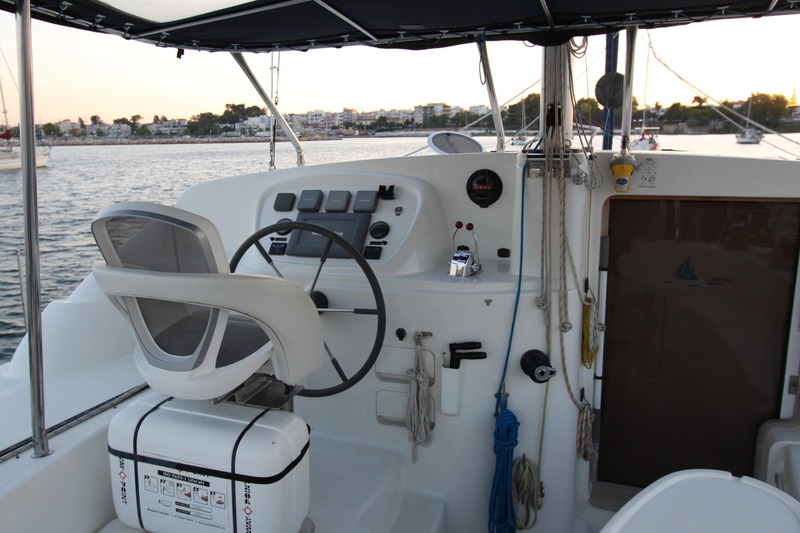 Electric anchor windlass (Quick) with up/down controls on foredeck and remote control/counter in cockpit. 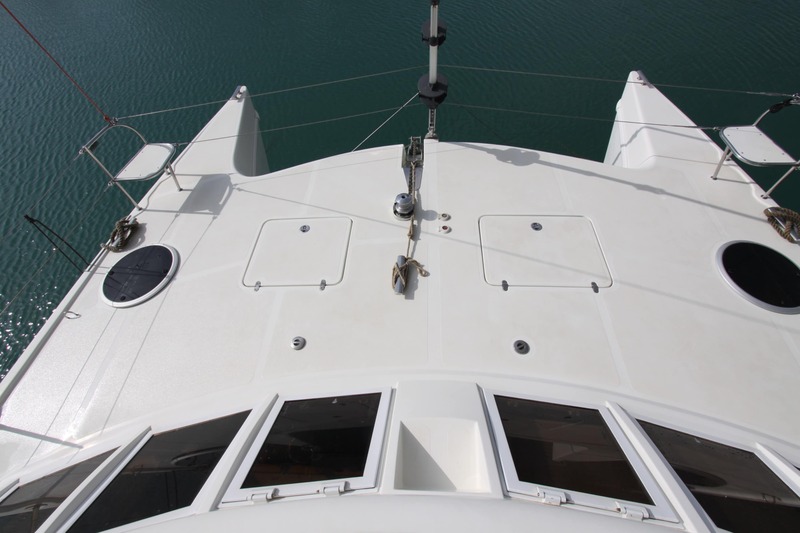 Anchoring cleat on centre foredeck. 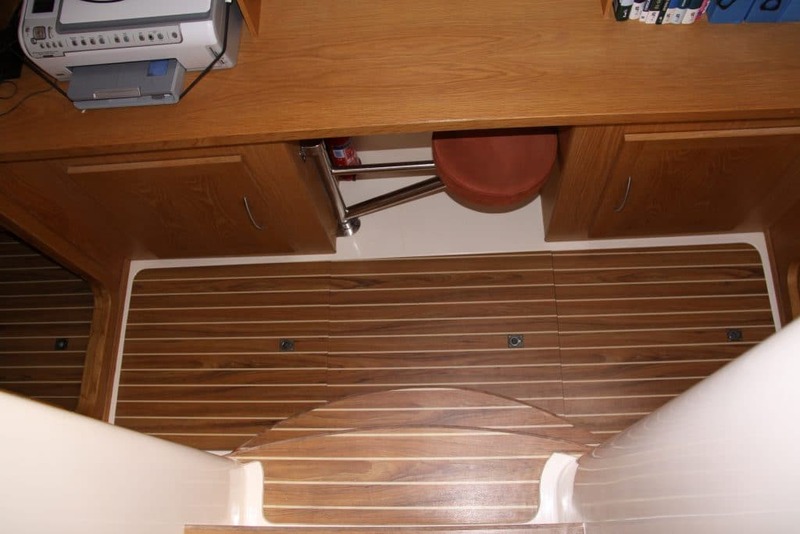 S/s boarding ladder with teak steps. Lightweight s/s Simpson davits (75kg). 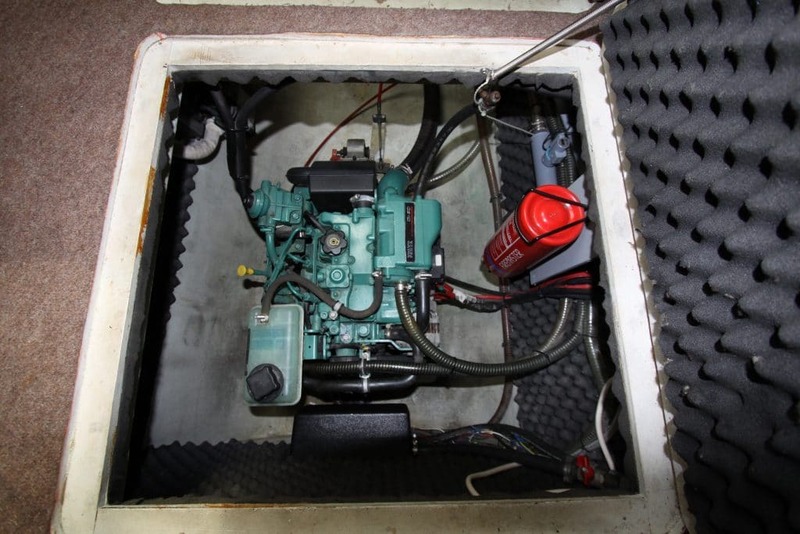 Mooring cleats port and stb to fwd, stern and midships. 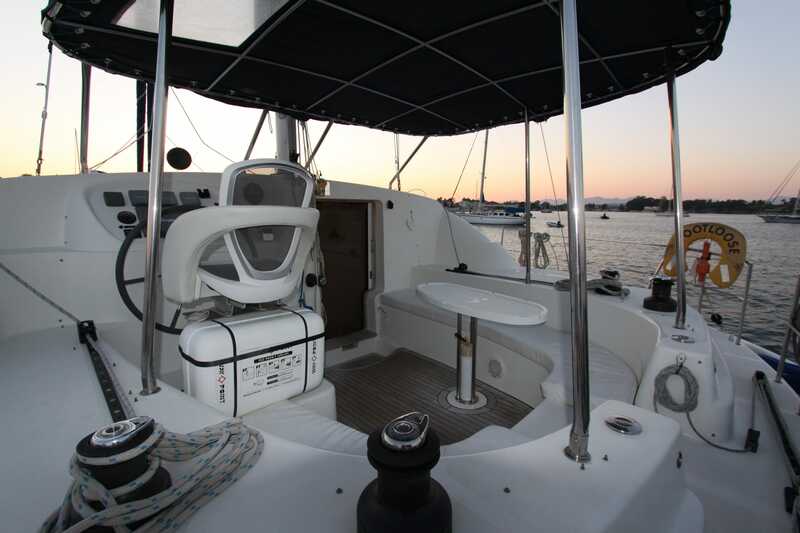 Additional cleats port and stb at extreme bow and inner stern. 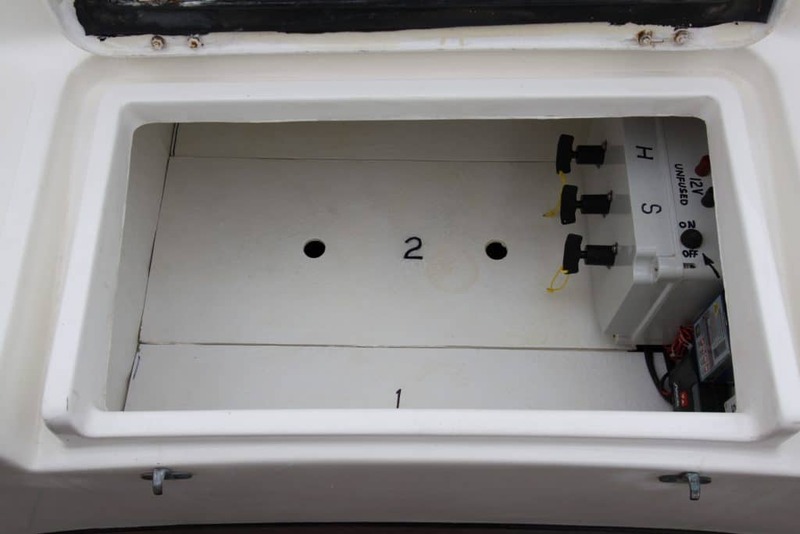 Harken two speed 44:1 self tailing winches x 2. 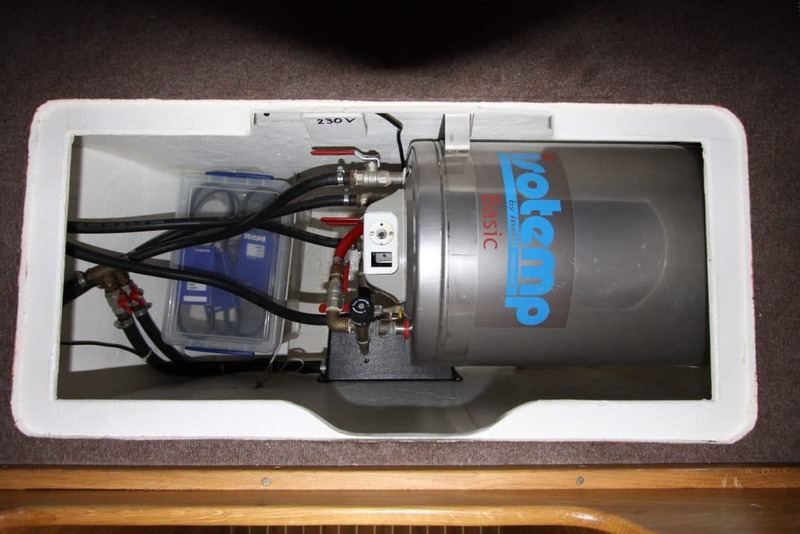 Harken two speed 48:1 self tailing winches x 2. Harken single speed 16:1 halyard winch x 1. Adjustable sheet tracks for genoa x 2. Harken fixed turning blocks for genneker sheets x 2. Mounting eyes for jackstays x 4. 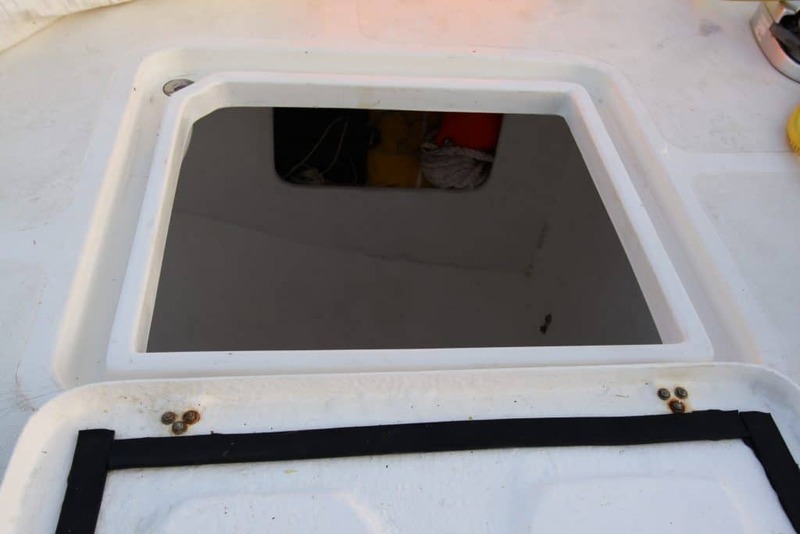 S/s coach roof grab rails to port and stb. Double lifelines and stanchions all around. Lopolight navigation lights (Tricolour/anchor and deck). 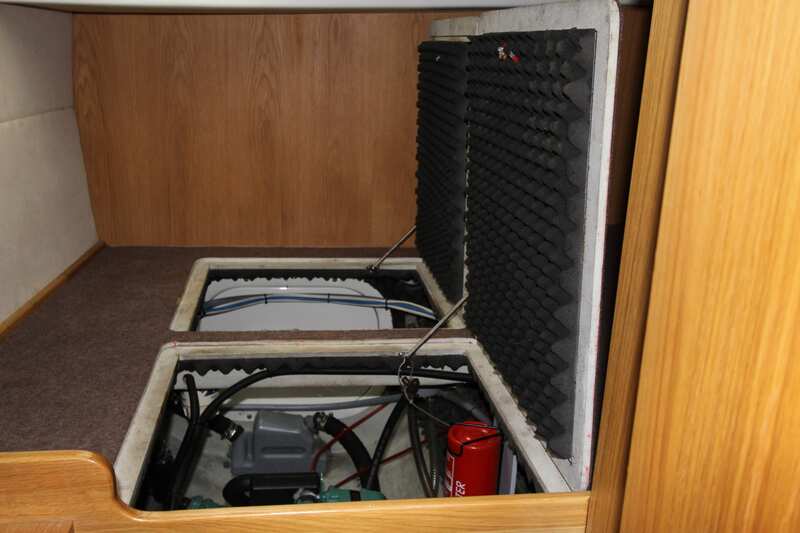 Auto fire extinguishers in engine bays. 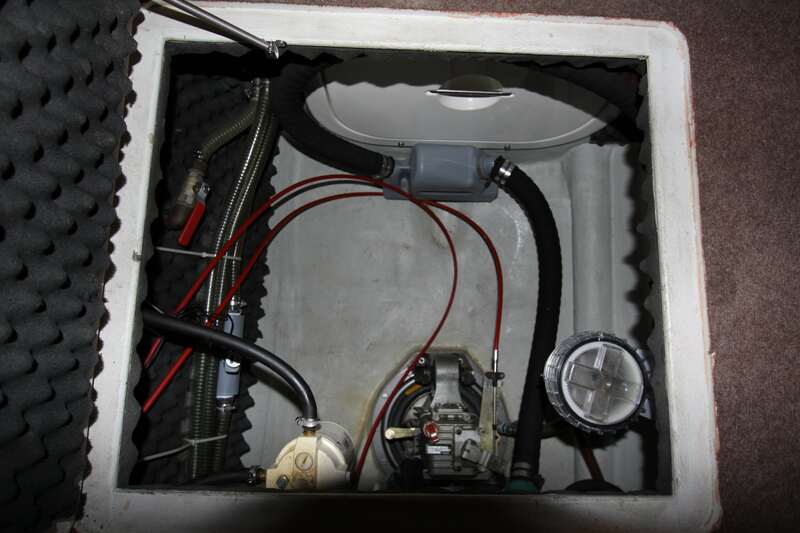 Auto bilge pumps in engine bays. 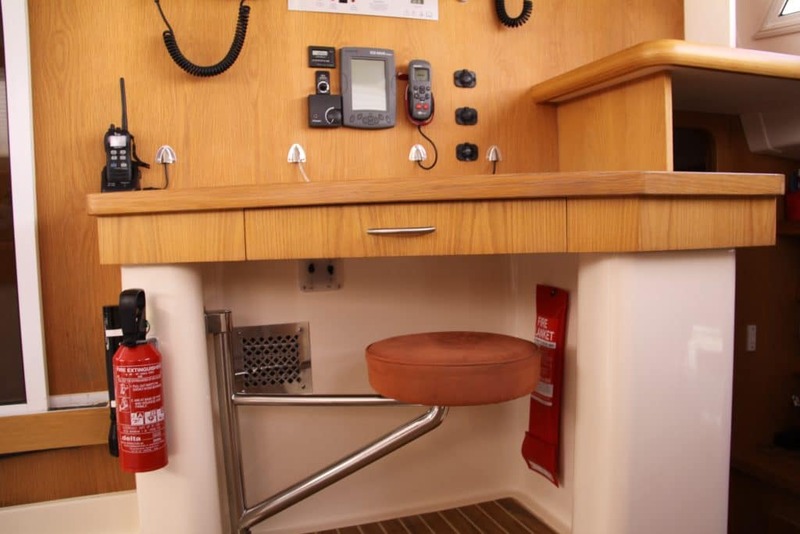 Mounted fire extinguishers to saloon and each hull. Automatic life jackets x 4. Horseshoe lifebelts plus drogues and lights x 2. 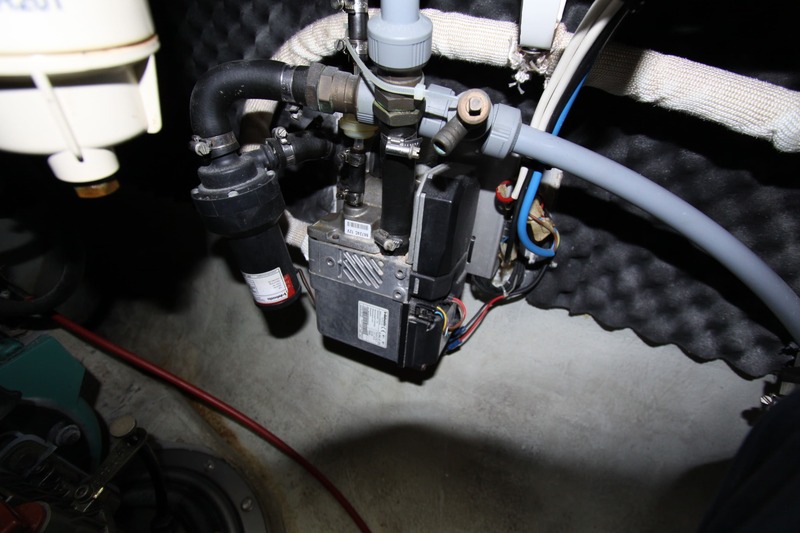 Manual bilge pumps x 2. Throwing rescue line x 1. 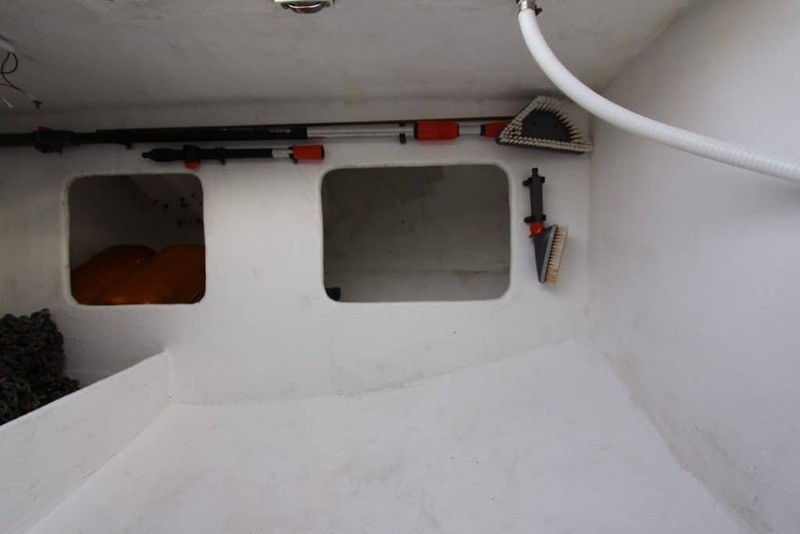 Waypoint four man life raft (to be submitted for service at point of sale). 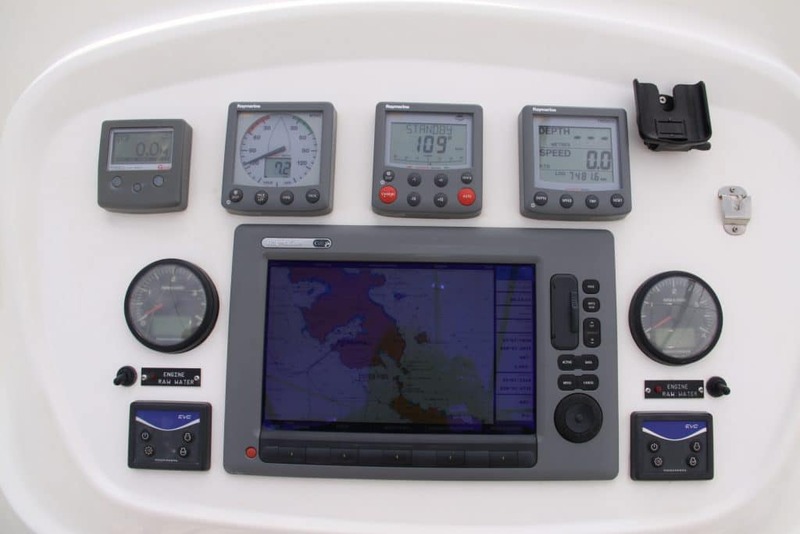 Raymarine 18 inch radome radar. Raymarine ST6002 Smartpilot autohelm with remote. Smartpilot controller. HM-195 COMMANDMIC remote control microphone in cockpit.